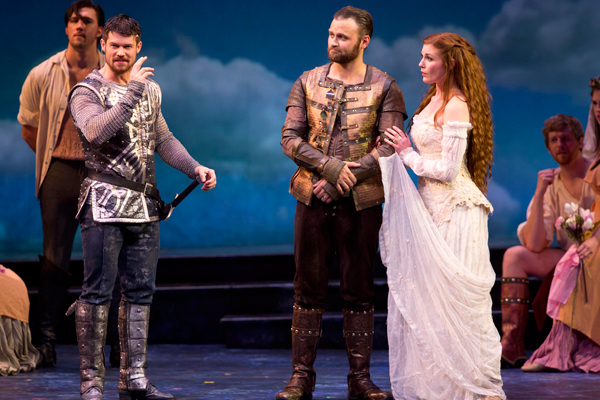 Camelot sets to music beautifully T. H. White’s The Once And Future King. As Arthur prepares to ascend the throne with the help of Merlyn the magician, he accidentally meets his bride-to-be, Guenevere in the forest. Both are apprehensive of marrying someone they have never met, but are pleasantly surprised when finally introduced and are happily wed. Meanwhile, Lancelot hears in France of the Knights of the Round Table, and travels to Camelot in hopes of joining. Although he proves himself arrogant and insufferable, King Arthur embraces his friendship and Guenevere eventually falls in love with him. When Arthur learns of their love, he remains silent for the sake of the peace that Camelot has enjoyed for some time. Arthur’s illegitimate and evil son Mordred arrives and while attempting to ascend the throne, uncovers Guenevere’s vulnerability and sets out to destroy his father’s legacy. Camelot, Book and lyrics by Alan Jay Lerner. Music by Frederick Loewe, Director Michael McFadden. Musical director Marshall Keating. Costume design by Paul Tazewell. Now through May 17, 2015 at the Ordway Center for the Performing Arts, 345 Washington St, Saint Paul. Tickets at http://www.ordway.org or 651-224-4222.